After setting up your Website Care plan, you can start requesting updates to your website. Go to Professional Web Services and log in with your username and password. 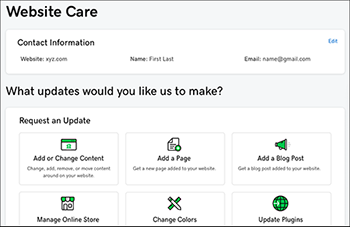 Find your Website Care plan and click Manage. In the Request an Update panel, choose which update you'd like to make. When you finish your first request, you'll be able to choose other updates. Fill out the form fields with your information and click Done. When you've requested all of the updates you'd like at this time, click Submit Request. 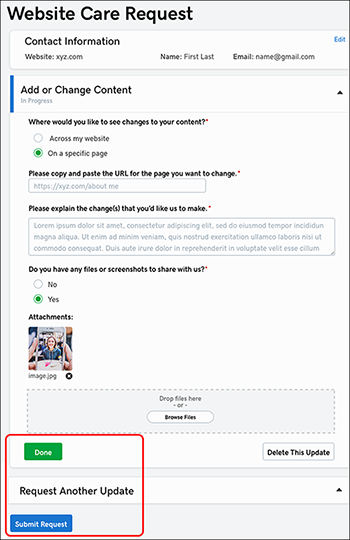 If you have another update to request, select Request Another Update and fill out that form. After you select Submit Request, you'll be asked to confirm your action by selecting a second Submit Request button. A final window confirms that your request has been submitted, and the team will get to work. You’ll receive an email when your update is complete. Note: If you want more updates after submitting this request, please wait until you receive an email from us telling you we're done. You can then go back to Website Care and make a new request. Videos .mp4 If you can't convert to an .mp4, we recommend uploading your video to YouTube and sending us the link. (Otherwise its performance on your website will suffer). (e.g. ^%&$,@#) Rename and remove all special characters from the file name and then upload. Vielen Dank für deine Vorschläge. Um mit einem Mitarbeiter unsere Kundenservice zu sprechen, nutze bitte die Telefonnummer des Support oder die Chat-Option oben. Gern geschehen! Können wir sonst noch etwas für Sie tun? Tut uns leid. Teile uns mit, was unklar war, und warum diese Lösung nicht zur Behebung des Problems geführt hat. Kann ich meine Website aktualisieren, nach der Veröffentlichung im Internet? Unsere Experten helfen gerne weiter.